Buying a stroller can be a particularly difficult task, especially if you are having your first baby. There are thousands of models available on the market, but how do you choose the one that best meets your needs? The Baby Trend Expedition Travel System is an all-terrain stroller that glides smoothly on most surfaces, from grass to cement, and it comes with a plethora of features and functions that every parent will appreciate. 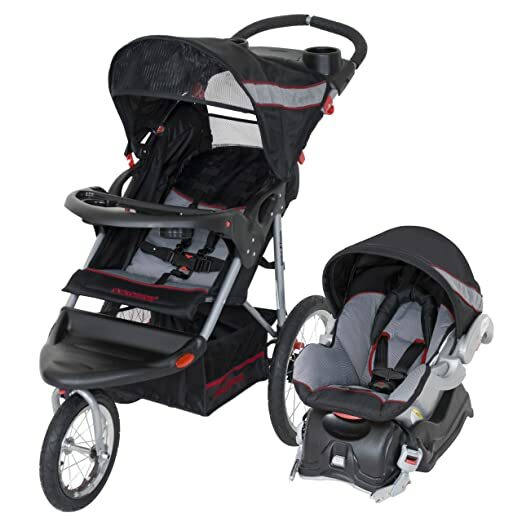 From a large ratcheting canopy and a generous storage basket to a swivel wheel for extra maneuverability, the Baby Trend Expedition LX Travel System has everything you could possibly wish for in a high-quality baby jogger, and more. This review will emphasize on the most notable advantages and disadvantages of this all-terrain stroller as presented on Amazon by other clients, along with a bottom line that will help you decide whether this baby stroller is the best one for your needs! The Baby Trend Expedition Travel System is very feature-rich and cost-effective, and this has certainly drawn the attention of many parents who are looking for a good, comfortable, lightweight yet secure stroller for their babies, one that will offer them the best value for their money. One of the main benefits of this travel system is the fact that it is perfect for active parents who want to jog and to stroll their babies at the same time. This is an all-in-one jogger that will help you stay fit while allowing the little one to take a breath of fresh air, not to mention that the infant car seat is very easy to move and carry between the stroller and the car! Another notable benefit based on customer reviews is the fact that the handle of the stroller is actually very easy to grip and hold, it is comfortable and it is designed to prevent hand fatigue by minimizing the amount of pressure you put on your wrist while jogging. You can firmly and comfortable grip the handle of the stroller and keep your baby safe, regardless of the circumstances. Besides this, this travel system also features a beautiful and stylish canopy that can be easily retracted at different angles, so that it will shield the baby from the damaging effects of the UV lights at all times. Last, but not least, this travel system can be folded quickly and effortlessly, and it is also very compact which is particularly important for parents who are always on the go and who do not have too much storage space in the back of their car. This is an all-weather and all-terrain jogger that can be used in any condition. Just like any other baby jogger on the market, the Baby Trend Expedition Travel System also comes with some disadvantages. As mentioned above, it can be a bit difficult to transport if you have a vehicle with a very small trunk, although there is no problem for those who own SUVs or spacious cars with large trunks. To sum it all up, the benefits of this baby stroller certainly outweigh its disadvantages, and it is one of the travel systems that offer the best quality for the money. Lightweight, safe, compact and very entertaining at the same time, this is a full swivel wheel that is perfect for parents who are on a tight budget, yet who do not want to make any compromise in terms of safety or comfort!